Joint, Tendon, Ligament II (Stem Cell Support) is designed to support healthy stem cell function and assist in new tissue growth. Nutrients, such as Vitamin C and Pterostilbene supoort normal mesenchymal cell growth, migration and proliferation. The combination of L-Carnosine, Vitamin D3, green tea and blueberry also may influence stem cell activity. 3 capsules daily with a meal – 90 capsules per container (a 30 day supply). $52.60 is the suggested retail price for a 90 tablet bottle. The product source contains no information about product guarantees or return policies. The product source does include a toll free number to use to contact the company. This product is expensive. The product source provides limited information about the product and what it does along with no customer reviews or information about product returns and guarantees. Anyone considering purchasing this product would be wise to contact company customer service (the product source contains an 800 number to use to contact the company) to ask about product guarantees and returns and also to ask about product user reviews and testimonials. 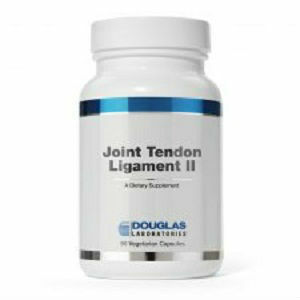 Mark Stevens	reviewed Douglas Laboratories Joint, Tendon, Ligament II	on January 2nd	 and gave it a rating of 2.